Fucoidan is a kind of excellent polysaccharide with various physiological effects, which include the abilities of anti-oxidation, anti-cancer, radio-protection, anti-virus, anti-coagulation, immune modulation, renal benefit and so on. Its multi-function has been proven by science researches. Taking fucoidan can help you to boost the immune system, help you to eliminate the harm of ROS (reactive oxygen species), prevent the clotting in your blood vessels, as well as keep your kidney healthy. Its outstanding properties distinguish itself among the health ingredients. And deeper studies on fucoidan are under way now. We believe that it will bring us more surprise. The functions of Laminaria japonica Fucoidan are all experiment-proved. And our fucoidan has been used into the medicine for the treatment of chronic renal failure which has been launched into the market. It's really effective! As normal food, kelp (Laminaria japonica) has been eaten by Chinese people for a long time in the history. 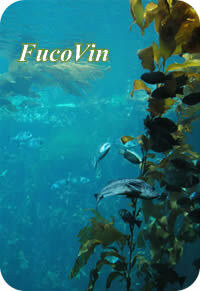 Fucoidan is natural composition in kelp and is safe for daily use. The animal test on its acute and subchronic toxicity has been done, which has shown that a daily use of 300mg/kg body weight fucoidan for rats is undoubtly safe. There's no adverse effect on that level. In the past, organic solvents were usually used in the extract process of fucoidan, including the decoloration and the precipitation. Now we adopt new water-based extract technology to make sure that no organic solvent is used in the entire production. 1. Where's FucoVinTM Fucoidan from? Fucoidan is a kind of seaweeds polysaccharide. There're various seaweeds that can be used for the extract of fucoidan. The main manufacturers in the world have fucoidans from different origins. Our FucoVinTM Fucoidan is extracted from kelp (Laminaria japonica), which is cultivated in the Chinese Ocean, and it has been used as food for a long time in the history, and it’s also a good source of fucoidan. 2. Is the effect of the FucoVinTM Fucoidan from kelp test-proved? The origin of most fucoidan in China is kelp, so the science research about fucoidan is almost on Laminaria japonica fucoidan. The effect of the fucoidan from Laminaria japonica has been proved by the research, and we can get the detailed result on scientific journals. More information, please contact us. 3. Is it safe to take FucoVinTM Fucoidan? Is there any side effect? The origin of FucoVinTM Fucoidan is kelp, which is a normal food. And the animal test has shown that there was no side effect to take fucoidan orally if the amount is proper. A daily use of 300mg/kg body weight is safe, and no adverse effect appeared. 4. What kind of food can FucoVinTM Fucoidan be added into? Fucoidan is water-soluble powder without any unfavorable taste or smell. You can add to food like beverages, milk products, cereals, meat products, soy bean products and so on. There’s no amount limitation, just take the organoleptic feeling of the finished product into your consideration. 5. Can FucoVinTM Fucoidan be used into the cosmetics?